You will find that even just the flesh from half a melon with a bit of ice and lemon will make too much liquid to fit back into the watermelon shell. Store any leftovers in the fridge ready to top up the watermelon. It’s best to blend and serve immediately. I don’t use a sieve as watermelon seeds are edible and healthy. But if you like it smooth then strain as you pour it back into the watermelon. 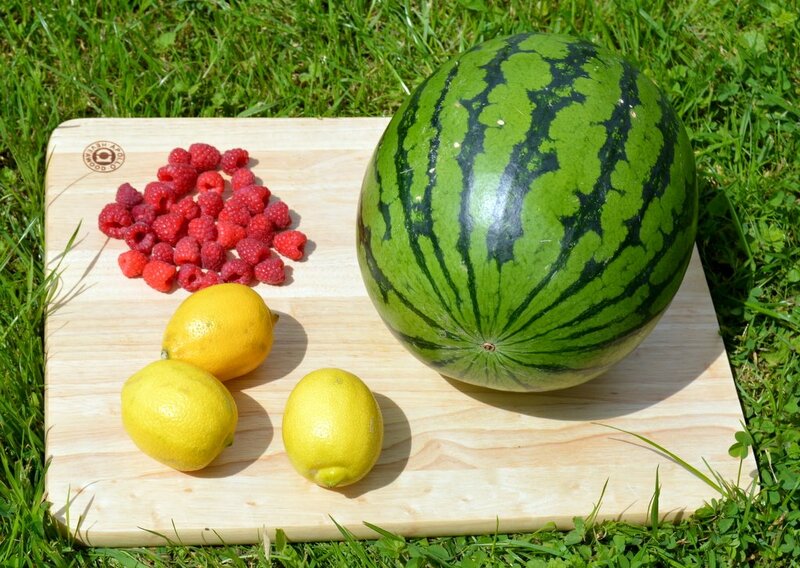 You can do a whole watermelon and just slice the top off if you want a few litres of lemonade, remember to double the ingredients. Garnish with slices of lemon, raspberries and mint leaves. Taste the juice before serving as the fruits all vary in size and taste. 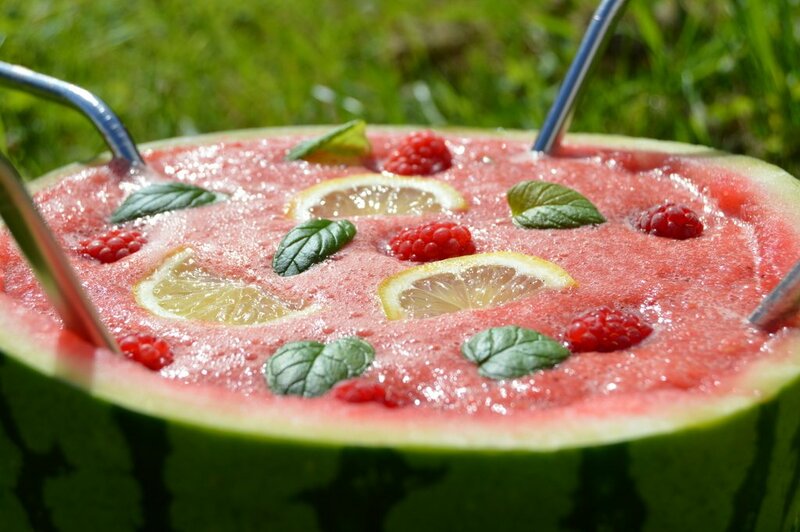 If it’s too sweet add more lemon, too sour then add more watermelon. Cut the watermelon in half. Score and scoop out all the flesh. 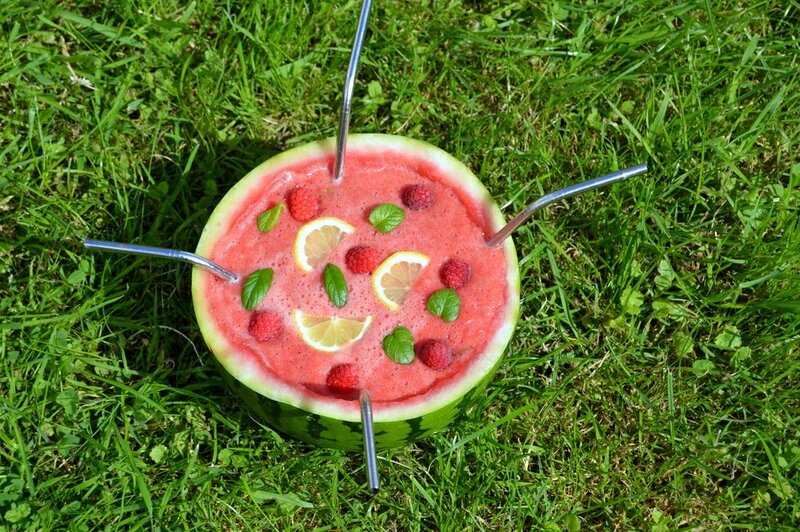 In a blender add the watermelon, lemon juice and raspberries. Whizz until all is combined and the watermelon seeds are broken up. Serve with ice in the watermelon shell and drink immediately. Store in the fridge for a day or two. Garnish with what ever you have about, I have lots of raspberries and mint in my garden at the moment so chose these. I’m using reusable metal straws that have so far lasted me years.